“Today’s hearing aids are not just smaller and sleeker, they’re also smarter,” says Wall Street Journal Digits reporter, Jenny Marc. These three “S”s sum up ReSound LiNXTM perfectly. Hearing aid users are looking for a discreet solution that helps them hear better and live life the way they want to, which is exactly what ReSound LiNX can give them. Six of Dr. Smith’s patients now use ReSound LiNX. One patient who vowed never to buy an iPhone even rushed to purchase one after trying ReSound LiNX. 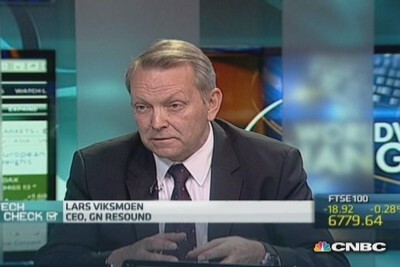 There are certainly hearing aid users that are not interested in what they consider to be “bells and whistles,” but as CEO, Lars Viksmoen, points out in a CNBC interview, even if you don’t have an iPhone®, ReSound LiNX offers the best hearing aid sound quality money can buy. Period. The Made-for-iPhone feature (“the fancy part”) is a bonus added to what is in reality, the very best hearing aid on the market. Do you agree? Share your experiences with ReSound LiNX. This entry was posted in Company News, In The Media and tagged Lars Viksmoen, Made for iPhone, ReSound LiNX. Bookmark the permalink.